The Coastal-Marine Research Group (C-MRG) is established under the auspices of the Institute of Natural and Mathematical Sciences (INMS) at Massey University, Albany, New Zealand. 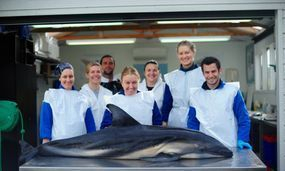 Our team of staff and postgraduate students undertake marine ecological research within and beyond New Zealand waters, concentrating largely on conservation and management orientated questions. Research foci include the anthropogenic impacts on marine systems, the biology and population ecology of marine organisms and marine ecosystem dynamics. Our specific strengths include marine mammal biology and ecology and quantitative marine ecology. Since 1998 our research efforts have broadened from marine mammals to include other marine taxa such as birds, reptiles, and fish. For more information on the various research programs visit publications for a list of our peer-reviewed papers and reports.